Castle or Clubhouse? 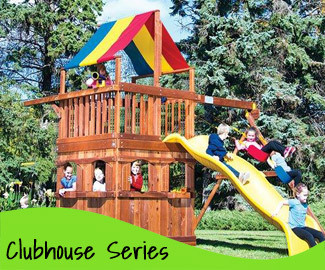 The first step in designing your family's dream swing set is to select either our Castle Play Systems series or our Clubhouse Play Systems series. Each is filled with endless adventures and years of imaginative play so there's no wrong choice. You simply need to determine which types of play are the best fit for your children. The primary difference between the two swing set designs is the key play areas. 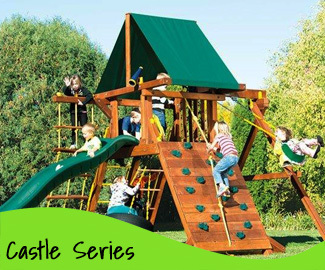 The Castle series offers more open play areas whereas the Clubhouse series provides more clubhouse-type options such as a fort, picnic area, playhouse, sandbox or general store. To help you make the best choice for your family, we’ve outlined the unique features of each play systems series below.